As the global game industry makes its way toward $ 100 billion in sales, the growth is happening on all fronts. Mobile either has or will shortly become the biggest part of the market, based on various market research reports. While mobile gaming has grabbed most of the headlines, the other emerging story is that gaming on the PC is also seeing a resurgence. Some people may think that mobile is killing the PC, but what’s happening in gaming doesn’t reflect that. One the eve of the PAX Prime gaming culture convention in Seattle, and just a week after the Intel Developer Forum in San Francisco, the forward progress of the PC as a gaming platform is obvious. It may seem like an old observation, but the PC is a critical part of the global gaming economy. We can talk about the changing market in terms of innovations on the PC as well as illuminating data that illustrates the rate of growth. And since gaming drives technology faster, non-gaming uses of the PC are going to benefit from this technological progress. By the end of 2016, PC game sales are expected to reach $ 29 billion around the world, compared with $ 28 billion in sales for the console market, according to a market analysis by PwC, the big accounting company. PwC also found that games are now a bigger worldwide industry than books, home video, the movie box office, and music. The PC is the hub for esports, and in Asian markets such as China, the PC still rules. As the newest consoles begin to age, the PC has once again returned to its role as the leader in innovation. This summer’s launch of Microsoft’s Windows 10 operating system, with a refresh of the DirectX 12 graphics technology, has taken the base PC platform up a notch. DirectX 12 graphics enable games such as Oxide Games’ Ashes of the Singularity, which can display more than 10,000 objects on the screen in a gigantic sci-fi real-time strategy battle. Other application programming interfaces (APIs) such as AMD’s Mantle and Khronos Group’s Vulkan will also enable much better 3D graphics in future games. Intel’s RealSense camera — which has motion sensing and gesture controls — will have new applications in games, such as making it easy for Twitch broadcasters to stream their own images and change the backgrounds in their livestreams. Monitors with 4K resolution are coming, and virtual reality systems will be most powerful on the PC. And if all goes as planned, Valve will be launching its Linux-based Steam Machines this fall as rivals to Windows-based PCs. 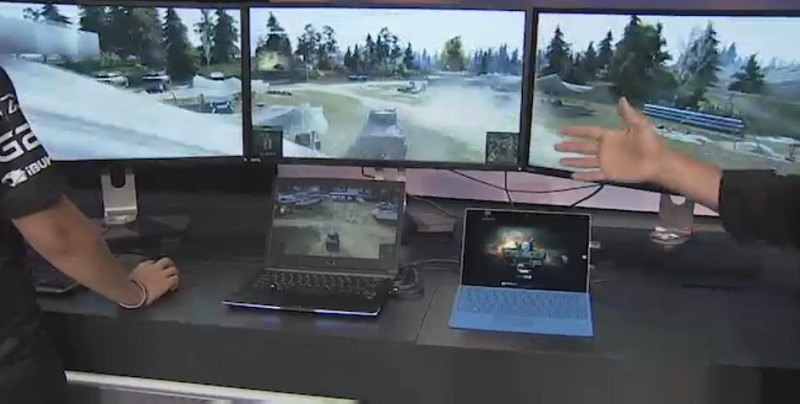 Above: World of Tanks played on three 4K monitors driven by Intel’s Skylake processor. At IDF, Intel showed off a demo of three 4K monitors running World of Tanks, a popular (and money-making) multiplayer shooter with tanks. 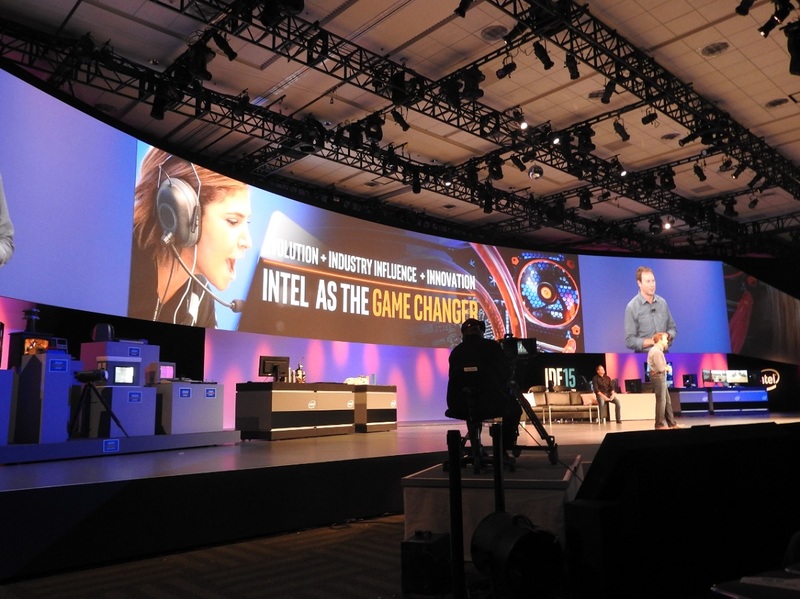 The PC was running on Skylake, the code name for Intel’s newest microprocessor that will debut shortly. Nvidia and Advanced Micro Devices also recently launched graphics cards that will make 4K gaming on the PC much more affordable. Intel has increased the graphics performance of its base PC platform by 100 times over the past decade, and Skylake and its upcoming Iris and Iris Pro chips will continue to move graphics performance forward. Intel also showed off a new kind of memory, dubbed 3D XPoint, which will be 1,000 times faster than current flash memory chips. Chris Roberts, the head of Roberts Space Industries and creator of the Star Citizen universe (an immense game where you fly starships, explore, and fight, among other activities), said the Intel 3D XPoint memory technology in the upcoming Intel Optane memory chips will enable games with huge virtual landscapes and no loading screens. Normally, such huge worlds just aren’t possible, and loading screens take forever in high-end games. And startups such as Shinra Technologies and Improbable are planning to enable supercomputing cloud solutions that will make massive game simulations possible across a wide variety of machines. 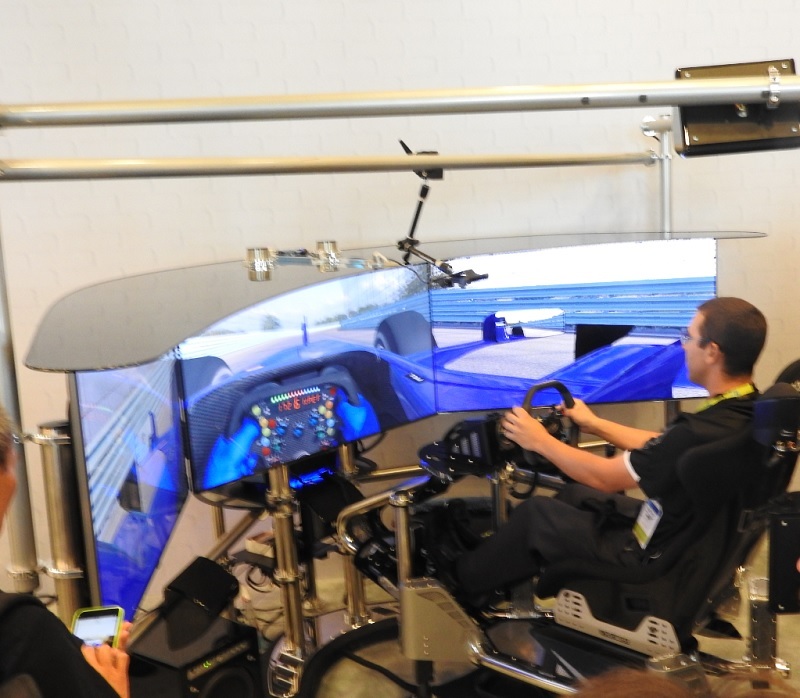 Above: iRacing and VRX showed an awesome racing simulator at IDF. All around, it’s just a good time to be making games on the PC, and there’s a lot of data in support of this trend. The current generation consoles are expected to sell more than 200 million units by 2019, according to DFC Intelligence. But the market researcher believes that both the Microsoft Xbox One and the Nintendo Wii U will sell considerably less than the previous generation of machines from those companies. There are an estimated 1.7 billion gamers, or about one in five people on the planet. About 1.2 billion are PC gamers. And of those, 711 million consider themselves to be active gamers and buy one game a month, according to Intel. That’s one in 10 people in the world who are active PC gamers. Valve’s Steam digital distribution service has more than 125 million active users. In the U.S., the average age of gamers is 35, and 48 percent are women. Roughly 74 percent of kids play games. And in China, which is becoming the biggest gaming market in the world, more than 70 percent of gamers play on PCs, according to Intel. Above: Kirk Skaugen at Intel spent a whole session talking about the rise of PC gaming. These active gamers refresh their PCs every two years, compared to every six years for other people. The total PC gaming hardware market is expected to grow from $ 24.7 billion in 2014 to more than $ 31.89 billion in 2018, a compound annual growth rate of 6.5 percent, according to market researcher Jon Peddie Research. Game console hardware sales, meanwhile, are expected to shrink from $ 12.5 billion in 2014 to $ 9.8 billion in 2018. The PC’s growth is based on a broad range of hits. The PC has become popular with kids in part because of the popularity of Minecraft, which has sold more than 20 million copies worldwide. Older gamers are also playing multiplayer online battle arena (MOBA) games such as League of Legends and Dota 2. The recent Dota 2 championships in Seattle filled a whole stadium as two teams competed in the finals for a $ 6 million prize. Professional gaming has become a huge sport, and the spectators in that community are growing daily. The esports business now has about 134 million spectators, and it’s a $ 612 million market. Intel’s own Extreme Masters events with the ESL, one of the world’s largest esports leagues, draw players from 180 countries. Twitch, the gameplay livestreaming site acquired by Amazon last year, has more than 100 million viewers a month. Market researcher Newzoo estimates that revenues for esports in 2015 will surpass $ 250 million. Prize money for esports tournaments has almost doubled in the first five months of 2015, compared to the same period a year ago. At the current rate, the global prize pool will grow to $ 71 million. That’s plenty of money to support the careers of people who play games for a living. And most of that action is on the PC. And one of the biggest boons for the PC could be virtual reality. Tech advisor Digi-Capital estimates that virtual reality and augmented reality will become a $ 150 billion by 2020. VR and AR could drive upgrades of PCs, as Facebook’s Oculus VR division has acknowledged you need a fairly beefy PC to run VR properly. “Virtual reality could be the biggest thing,” said Kirk Skaugen, head of the PC Client division at Intel, speaking at IDF. So there. PC gaming is growing. A lot of things are driving it. And PC gaming is driving technological progress for the whole world. 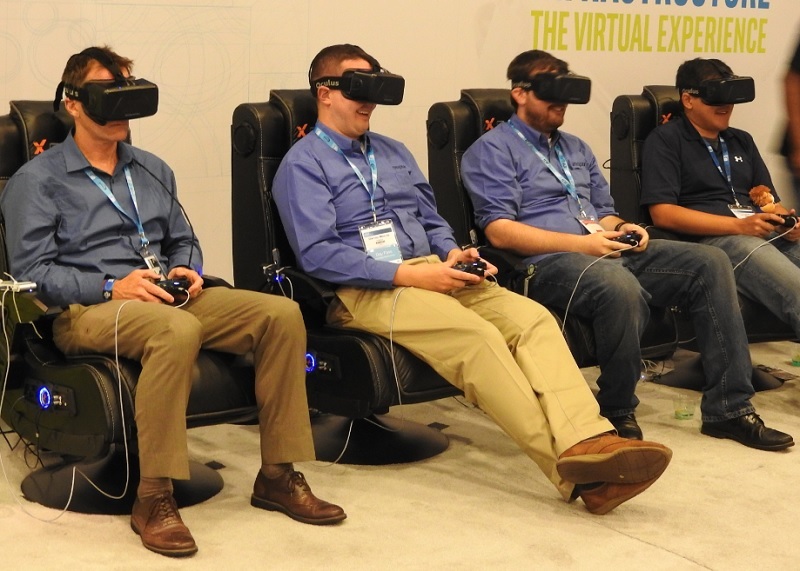 Above: Demos of the Oculus Rift virtual reality goggles at the Intel Developer Forum.